After a whirlwind year in sports, ESPN The Magazine has crowned its Dec. 26/Jan. 2 edition the “Anything Is Possible” issue. 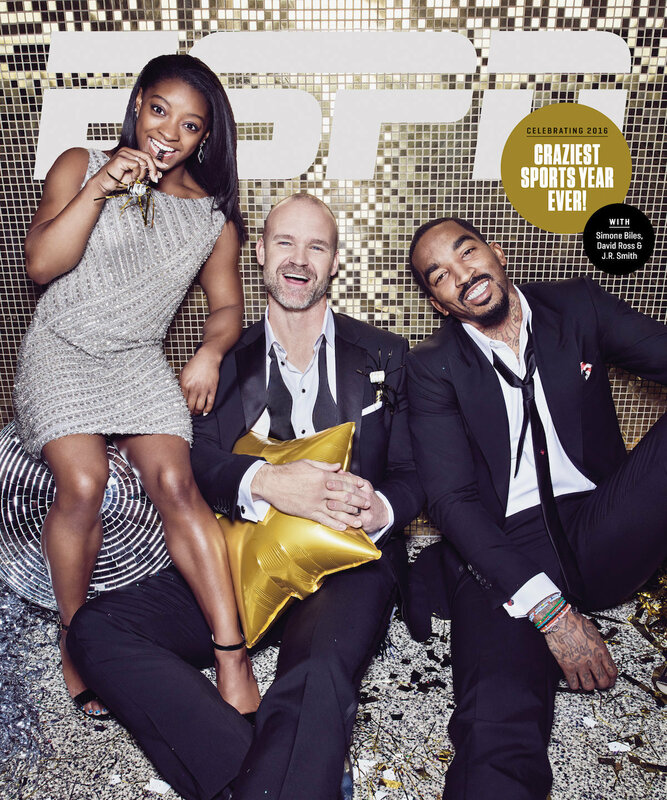 With Olympic gymnast Simone Biles, retired Cubs catcher David Ross and Cleveland Cavaliers guard J.R. Smith on the cover, the celebration of conquering hurdles is in full force. These three incredible athletes stood out in some of the most intriguing highlights this year. Biles captivated the world as a member of the “Final Five” and won gold in individual all-around, vault and floor at the 2016 Olympics. Smith, along with his teammates, beat the Golden State Warriors in the NBA Finals on June 19 after being down 3-1. And Ross hit a home run in the World Series—leading the Chicago Cubs to win the 2016 National League Championship Series—breaking their losing streak. Each of these individuals did the impossible—making them ideal cover stars for this issue. The cover was shot by duo Mark Williams and Sara Hirakawa, and it evokes a glamorous New Years Eve feeling with a gold and silver color scheme. Biles looks dolled up, yet casual, in a silver sequined dress and black ankle-strap heels. Smith and Ross rocked similar black suits but wore different unraveled black ties. Ross wears an undone bow tie and Smith casually sports a loose skinny tie. We wish were invited to this photo shoot because it looks like they had a blast. Check out ESPN The Magazine “Anything Is Possible” issue, on newsstands this Friday.